In this week’s guide to spotting a scamcoin, where we bring you cautionary tales of investments gone wrong in hopes of making you a better-informed investor, we present the story of Ethconnect: a “crypto lending program” for those who insisted on playing with fire. If you ever wonder what a “fake Ponzi scheme” was, here is your chance to find out. We also present some lessons to be learned from those who got burned and from the pro scam spotters themselves, in an attempt to give you an idea of behavior to be wary of before making your next crypto investment. These maneuvers were performed by trained professionals. Do not try this at home! The story of Ethconnect begins with its predecessor, Bitconnect (covered in last week’s article), which may or may not have been created by the same individual(s). Unlike the centerpiece personalities of our first two articles of this series, the founders of Bitconnect and Ethconnect remain entirely anonymous. This is where the behavioral differences among these scammers end, however, as the architects behind Ethconnect exhibit nearly the exact same egotistical characteristics of Bryce Weiner in article number one of this series, and employ the exact same psychological tricks of Jawad Yaqub in article number two. Because the tactics used by crypto scammers tend to be so repetitive and unoriginal, it’s nearly impossible to be suckered into the purchase of scammy products if one is made aware of what these tactics are. We will now apply the same signs as outlined in article number two of our How to Spot a Scamcoin series to Ethconnect to give you an idea of what you should be looking out for before plunking down your hard-earned money into a crypto investment. In November 2017, when the Ethconnect ICO launched, the similarly-named Bitconnect was on the verge of a total breakdown in user trust. Similarities were also abound in marketing tactics, as Ethconnect billed itself as a “lending platform” that offered huge, guaranteed monthly returns (as high as 50% — 10% more than promised by Bitconnect). 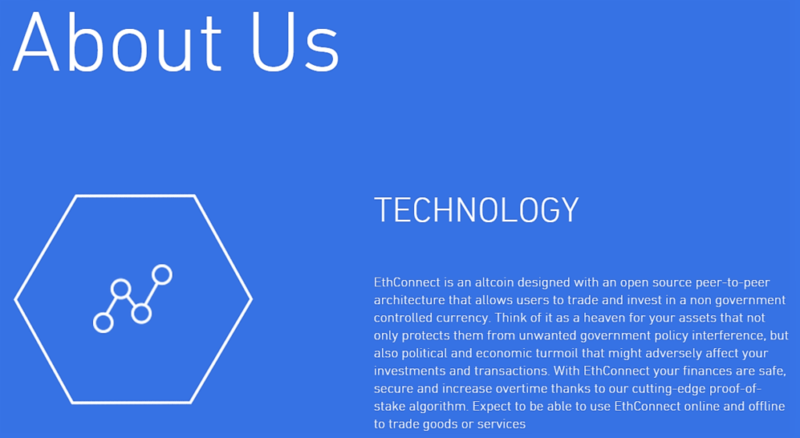 As soon as you get the EthConnect Coin, it becomes an interest bearing asset allowing you to earn interest in many ways. We have developed a model in which investors will be able to generate profits in many ways. Investors can hold their coins in their wallets and earn great amounts of returns over a matter of months and even greater amounts by holding longer and staking coins. Our coin will also allow miners to mine coins. Unlike Bitconnect, the “system native” coin for Ethconnect (ECH) was an Ethereum-based token and did not have its own blockchain, yet the pricing for its ICO was remarkably similar to the structure used by Bitconnect, in which purchasers were offered a “bonus” dependent on the quantity of tokens being purchased. Likewise, the price of tokens would increase depending on the number of tokens sold. Ethconnect did not rely upon classic media sources to promote their project. What they did do was generate a number of bitcointalk forum accounts which all had complimentary things to say about it, frequently taking the form of quelling investor fears or doubts or offering alternative solutions to a perceived problem. Interestingly, the forum member posting the Ethconnect ICO information to bitcointalk only made 2 posts before vanishing from the forum, relying on a flurry of sockpuppet accounts to do their bidding. For the most part, this seemed to work rather well — or well enough. 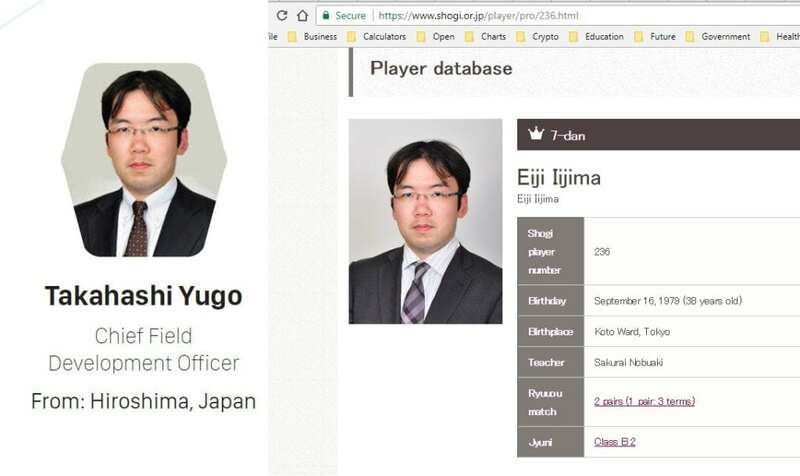 Within 24 hours of the ICO notice, the forum community was already crying foul, and the original poster (OP) was nowhere to be found. 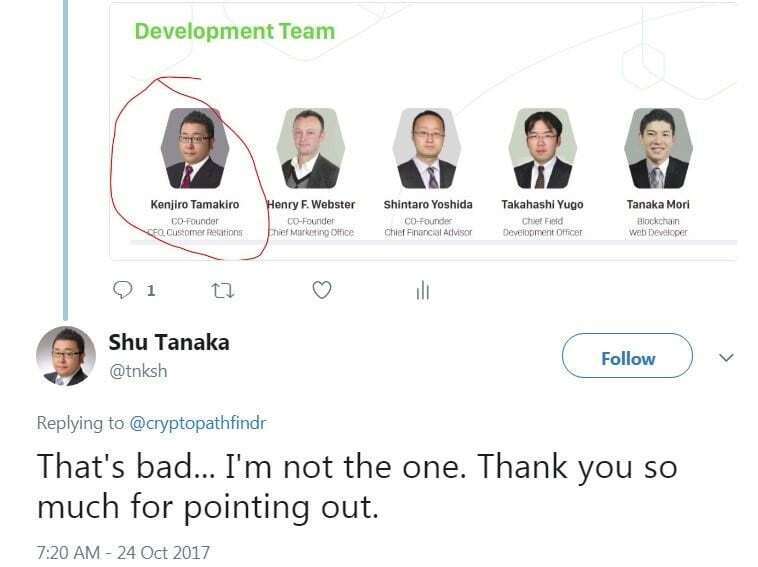 A fake team should have been evidence enough for any investor to steer clear of depositing funds into a crypto project, yet hundreds of people just couldn’t help themselves, either failing to do their share of due diligence and research into the project, or else who were severely blinded by the prospects of massive, easy returns. 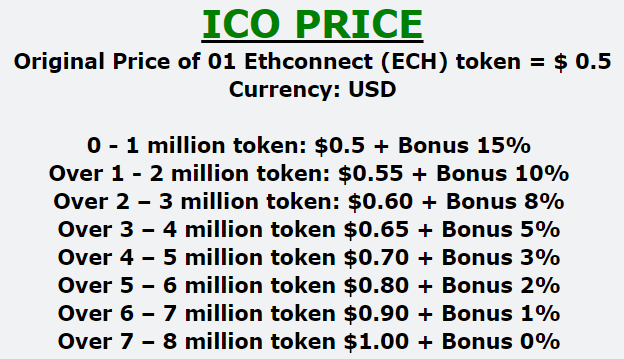 Ethconnect (ECH) does not apply only the Ponzi model but modifies it for better practical application. Now Ethconnect (ECH) only provides commission to the fifth level and only stops at the fifth level. Thus, Ethconnect (ECH) will completely eliminate the problem of liquidity and help investors feel more secure about Ethconnect (ECH). The Ethconnect ICO was to run from Nov 1st, 2017 through Nov 30th, with tokens being sold at prices increasing in different stages relative to the amounts being sold. So many participants were in a rush to get in ahead of each other before the launch of the next Bitconnect that the Ethconnect website began to experience severe errors, often kicking users out of the platform for no given reason or denying them entry altogether. By November 7th, Ethconnect had raked in over 1600 BTC from “investors” (approx. $11 million at the time), with thousands more yet to come. The launch date for the Ethconnect in-platform exchange was slated for Dec 20th, which would allow latecomers the opportunity to purchase tokens if they missed out on the ICO, and ICO participants to sell their tokens if they wished. However, on December 1st, the day the lending program was supposed to begin, Ethconnect announced that it would be continuing sales of ECH tokens as demand had warranted. This announcement was to the dismay of participants who had bought in according to what they thought were the rules, only to see those rules change at the last minute, making their involvement feel all the less special or wise. By December 10th 2017, the day that ECH staking program was supposed to begin, it came to light that no tokens had moved from the contract creation address (they still haven’t). It was particularly difficult to imagine how the managers of Ethconnect could keep track of how much to reward to whom for staking when all the tokens were being held by a single Ethereum address. Was it all to be managed internally? Had anybody actually purchased anything? The short answer was, “no,” they had not. Finally, December 20th came and went without the grand opening of the Ethconnect exchange, which had been “pushed back” to early January. There would be no early Christmas for ICO participants, and no profits distributed to “lenders” or “stakers” as promised. By this point, the jig was all but up, even though a desperate few who were perhaps in too deep continued to hold out hope for a miracle. The only problem with this replacement blurb was that ECH wasn’t an altcoin – it was an Ethereum token, and as such there was no viable way it could function via the Proof of Stake (PoS) mechanism as claimed. Furthermore, other claims made on the website that ECH was going to run on its own blockchain using a hybrid Proof of Work / Proof of Stake system looked all the more ridiculous, and it was also quickly pointed out how strange this was on the Ethconnect ICO announcement thread, in multiple instances. Simply put, Ethereum tokens aren’t mineable as they are all created at once via the deployment of an Ethereum smart contract. 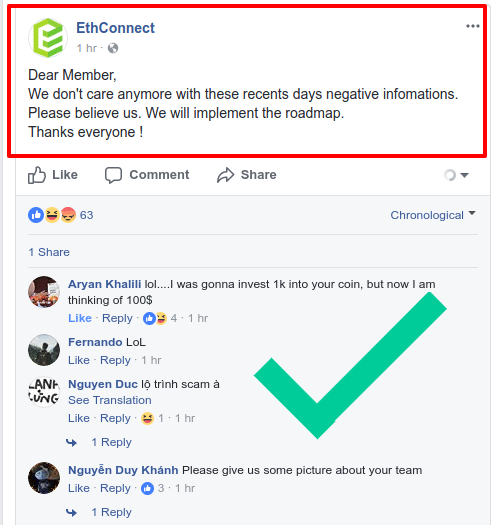 Even more incredibly, all of this contradictory, nonsensical or fabricated information had been posted by Ethconnect right from the start, and had been quickly debunked by the crypto community within the first two pages of the ICO announcement thread on bitcointalk. 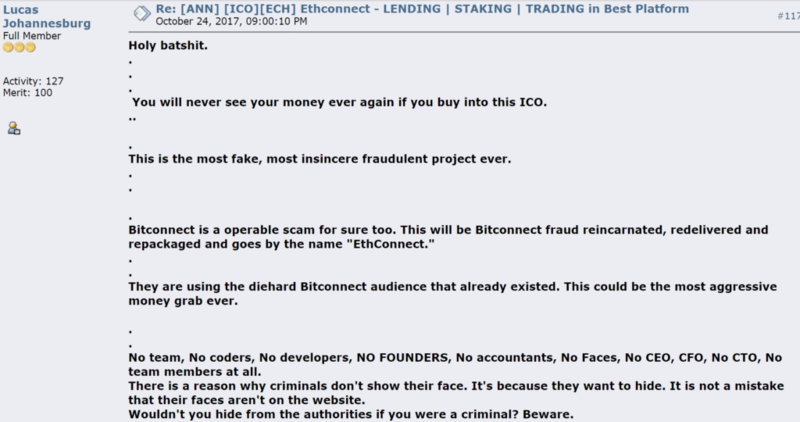 If that wasn’t enough (and it apparently wasn’t), expert ICO critics within the bitcointalk community pointed out time and again through the ICO period that Ethconnect’s behavior was exhibiting all the classic signs of a Ponzi scheme, only to have their warnings fall on deaf (or covered) ears. The only solution as to why people could continue to put money into something that was so obviously a scam was because they knew it was a scam and continued to invest anyway. One such “investor” even openly admitted this was the case, claiming to have made large sums of money from what they knew to be Ponzi schemes in the past. Only this time, the Ponzi scheme proved not even to be a Ponzi scheme but straight-up theft, ironically suckering in those who thought they would be doing the suckering. If this idea has even the slightest bit of appeal as an investment to you, we have to wonder how you got this far down the page and what you were doing the whole time when you were supposed to be reading this article. Until next time dear readers, stay informed, stay realistic, and stay away from scams!